17-year old Daniel Egboche first came into contact with the Foundation when he saw one of the Foundation’s College Academy teams training at Harris Academy South Norwood, where he is studying for a BTEC in art and design and a CTEC in sport. He is on the Autistic Spectrum and finds social interaction in large groups difficult. Although he was quite shy initially, Daniel politely introduced himself to all of the coaches whilst the training sessions were taking place and watched. He also asked a few questions about the programme and if it would be possible for him to join in at some point. The academy coaches were very happy to welcome him into the group and he took part in the next session, showing his skills to the rest of the team. However, after a few weeks, Daniel told the coaches that he was actually a goalkeeper and wanted to take part in the goalkeeper training – so he took part in the following session with the other three goalkeepers on the scheme. The coaches quickly saw his natural ability and selected Daniel for the second team. Daniel had impressed the coaches with his performances for the second team and his commitment so much that they gave him the opportunity to play for the first team. There was one particular game against Fulham where although the team lost, Daniel kept them in the game with a string of outstanding saves – which the whole team were talking about after the game. In fact, throughout the season, Daniel became more comfortable around the rest of the team, and developed a real bond with the other players. Since the programme started his confidence has grown, his physical health has improved, and he has developed friendships with his team-mates. The coaches will continue to encourage him in the future to improve physically and mentally, and support him to achieve his goals. Daniel says “I would recommend the Crystal Palace [Palace for Life Foundation] college academy to anyone who loves football. Its helped me improve my confidence, friendships and my football skills”. 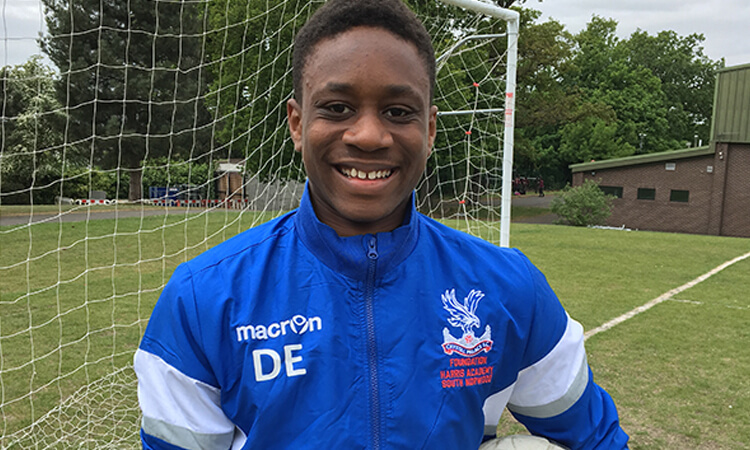 At the end of the season, Daniel got the opportunity to play for the Harris Upper Norwood U19s at Selhurst Park against B-Cot, another Foundation programme. This was a dream come true as his ambition is to become a professional footballer and play for his favourite team, Crystal Palace. To make the day even more special, Daniel kept a clean sheet as the team won 4-0.